St, Michael Catholic Church, originally known as SS. Cyril and Methodius Church, was built in Brookside, Alabama in 1896. The town of Brookside was formed at the opening of coal mines by the Sloss Sheffield Steel and Iron Company in 1894. Soon about 800 families were in the community, the majority of whom were Roman Catholic. Pioneer families in Brookside included Joseph and Matthew Slovensky; Louis Perunko; John and Alexander Slovensky (cousins of Joseph and Matthew Slovensky); Joseph Bakosh; Mike Pator; John Mikolay; John Sikora; Peter Patchen; Mike Perish; the Duchock brothers, John, Joseph and Kiser. Joseph Slovensky and Louis Perunko, leaders of the people, petitioned Bishop Jeremiah O'Sullivan, Bishop of Mobile, for a priest to administer the religious needs of the Catholics of the mining town and the area. The Bishop appointed Very Rev. James A. Meurer, pastor of Our Lady of Sorrows Parish, Birmingham, and Dean of North Alabama, to establish a parish at Brookside. On December 30, 1895, Bishop O'Sullivan purchased property from Joseph and Mary Slovensky for the sum of $33 (with no mineral rights included). It was a 104-foot and 4-inch square plot of land in Sec. 23, Twp. 16, Range 4, East, in Jefferson County, Alabama. The deed was witnessed by B. Zavelo and L.T. Kelly. Bishop O’Sullivan also purchased land from John and Ana Pavlik on December 30, 1895, for the sum of $ 1.00. This purchase was witnessed by Jas. A. Bivens and Louis Perunko. James Bivens was Notary Public, M.T. Porter, Judge of Probate Court, Jefferson County, Ala. (Vol 204, p. 546 and Vol. 203, p. 405, Jefferson County Deed Books). Father Meurer built a little frame Church in 1896 and worked among the people although he could not speak their language. He brought a Slovak Priest from New Orleans, Louisiana three or four times per year to hear Confessions. In 1898 Father Meurer asked Bishop Edward P. Allen to appoint Father Robert Reitmeier, OSB, of St. Bernard Abbey, Cullman as pastor of SS. Cyril and Methodius parish in Brookside. Father Robert, who could speak the Slovak and other languages used by the congregation. came in 1899 and was the first resident pastor. A rectory was built in 1900 and the Church was dedicated on May 15, 1899. In 1900 Father Robert had a mission at Blossburg Mine, and in 1905 an additional one at Republic mines. 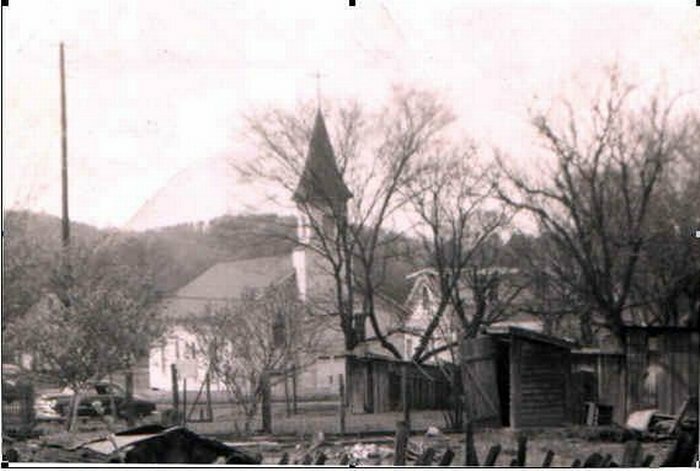 The parishioners came from adjoining communities as mines were opened by the Sloss Company: Italians from Cardiff; Frenchmen from the Republic and Pinckney City Mines; The Frank Heinz and Mueller and other German families from Sayre mines and Blossburg mines. Mrs. Mary Mueller was the first organist and continued until her death in 1913. She was succeeded by Mrs. Charles O'Neil of Cardiff. Mr. O'Neil was a prominent merchant, a non-Catholic. Mrs. O'Neil drove the family in a buggy to Mass and some of her children were John, Charles, and Irene O'Neil. The first wedding in the church was that of Miss Mary Perunko and John Slovensky in June, 1896. They were the parents of Stephen Slovensky, KSG. The first infant baptized in the church as Valentine Billetz, son of Mr. and Mrs. Joseph Billetz. Several parishioners who died were buried in the Bivens Family Cemetery in Brookside. On May 31, 1901, property was acquired from the Sloss Sheffield Company (one acre, more or less) for use as a cemetery. The terms of the acquisition were that no fee or charge for the lot or interment would be made and the lot was given and conveyed forever in trust. The property was to revert back to the company in event it was used for other than a "graveyard for the people”. Mike Ziak , who died Sept. 4, 1901, was the first interment in the Brookside Catholic Cemetery, which is located on a hill not far from the church. In 1904, Father Robert purchased two dwellings to use as a school and residence for Sisters. Three Benedictine Sisters of Sacred Heart Motherhouse, Cullman, came to operate the school. They enrolled 144 children when school began and later this increased to 182 students during the first year. When Father Robert retired from parish work due to ill health, he was succeeded by Father Celestine Mittermeier, OSB, also from St. Bernard Abbey, on June 5, 1906. During the pastorate of Father Celestine a break occurred in the parish when the Slovaks who professed the Greek Catholic Rite separated from those who professed the Roman Catholic Rite. The Greek adherents failed to obtain a priest for their church and proceeded to join the Russian Orthodox Church. The departure of these parishioners and others who left when strikes occurred reduced the parish membership. In January, 1911, Rev. Joseph Stangl, OSB, succeeded Father Celestine. He remained until 1920. Father Vincent Haegele, OSB, was pastor from 1920-1923. Three Benedictine Sisters taught 22 boys and 23 girls. Father Athanasius Meisenheimer, OSB, was appointed pastor in 1923. He repaired and redecorated the church and school and added rooms to the convent. Sister Cecilia, OSB, was superior and principal of the school and convent. She was assisted by two other Sisters in teaching 21 boys and 27 girls. Father Athanasius organized parish societies, the Holy Name Society, the Children of Mary Sodality and the Propagation of the Faith. In 1930, the Mission of St. Joseph in Warrior, Alabama, was attached to the Brookside parish. Mass was offered there twice monthly. There were 10 boys and 20 girls in the Sunday School classes. Sister Mary Beatrice Slovensky, OSB, of Sacred Heart Motherhouse, Cullman, a vocation from the parish, is the daughter of Joseph Slovensky. While Father Athanasius was still pastor in 1935, the congregation had dwindled to only about 30 families due to the depression years. So had the number of students in St. Joseph's School. The school that had been operated by the Benedictine Sisters since 1904 closed in 1936. Some of the Sisters who taught there were Sister Mary Grace, OSB, first principal, and Sisters Scholastica, Cecilia, Benedicta, Felicitas, Mary Agnes, Genevieve, Adelaide, Aloysia, and Henrietta. Father Leo Mayer, OSB, missionary from St. Bernard Abbey, sold the school and convent property in 1940. He used the funds to repair and redecorate the church and convent. Later this parish was placed under the direction of the North Alabama Mission Band. This group was organized by Father Frank Giri, who was succeeded by Father Joseph A. Durick as Director. Father Durick became Auxiliary Bishop to Bishop Thomas J. Toolen (and later Bishop of Nashville, Tenn.). He was succeeded by Father William V. Higgins who had assisted with the Missions since his ordination in 1949. In 1954, Father Higgins had the old church torn down and a new red brick building erected. Bishop Toolen dedicated the church on March 27, 1955. He was assisted by Auxiliary Bishop Durick, Abbot Bede Luibel, OSB, of St. Bernard Abbey, Cullman, and Rt. Rev. Francis J. McCormack, PA, VF, pastor of St. Paul's Parish, Birmingham and Dean of North Alabama. Rt. Rev. Theodore Kojes, OSB, a Slovak Benedictine Abbot from Cleveland, Ohio, preached the sermon. The new church was dedicated in honor of St. Michael, and in memory of Michael Madden, father of George S. Madden of Chicago, a friend of Bishop Toolen, who was chief benefactor in donating funds for the building. The marble altar was donated by Hugh and John McDevitt and the tabernacle was a gift of Steve Patchen. Many priests, both diocesan and of religious orders, and seminarians assisted on the Missions, as did the the Trinitarian Sisters. Father Higgins was succeeded by Father Edward L. Foster as Director of the North Alabama Mission Band. The Mission Band was dissolved and all missions placed under parishes. On November 16, 1967, St. Michael's was raised to status of a parish and Father Joseph Corradino appointed resident pastor. Missions attached included St. Raphael's, Graysville, and St. Alice, Edgewater. Brookside later became a Mission from Graysville. Some of the Priests who have served as pastor of St. Raphael's are Father John J. Owen, Father Raymond J. Murrin, and Father Robert Roeser. Father Adrian van Ruijven became pastor in 1975. On November 16, 1974, the Most Rev. Joseph G. Vath, D.D., Bishop of Birmingham in Alabama, blessed the graves and offered Mass in the Brookside Catholic Cemetery. He was assisted by Father Roeser and 125 persons were in attendance.